FACTS, FIGURES, HIGHLIGHTS AND THANKS! We are delighted to report that the 3rd International Conference on Driver Distraction and Inattention (DDI 2013) in Gothenburg was, based on the feedback we received from participants, a great success! 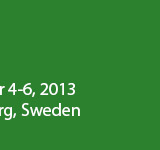 During the three days on September 4-6, 2013, we had nearly 150 participants in total, with 36% of the visitors coming from outside of Sweden. The delegates came from 23 countries: United Kingdom, United States, Japan, Netherlands, New Zealand, Norway, Republic of Korea, Spain, Germany, Greece, Israel, Italy, Australia, Belgium, Canada, Czech Republic, Denmark, Colombia, China, Switzerland, Finland, France, and Sweden! "It was great – even better than last year"
The positive feedback and the positive outcomes could only have been achieved with the great support of many people. At this point, we would like to thank the Scientific Committee and the supporting colleagues in the peer-review process, Keynote Speakers, presenters, the exhibitors, and last but not least everyone who attended the Conference! All the PowerPoint presentations and Peer-Reviewed Papers are now uploaded onto the conference website. Some of the papers, suitably expanded, will also appear in a book that will be published in 2014 by Ashgate, in the UK. We look forward to seeing you at the 4th International Conference on Driver Distraction and Inattention in 2015 in Sydney, Australia!